Figure 6-1. 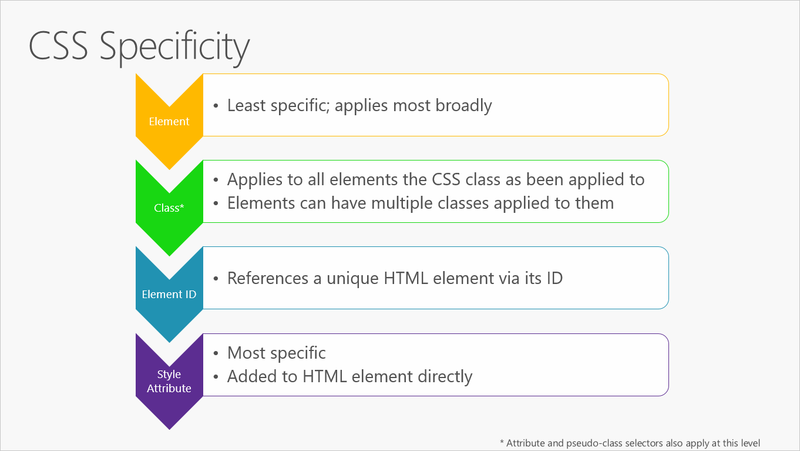 CSS Specificity rules, in order. It's best to keep styles in their own separate stylesheet files, and to use selection-based cascading to implement consistent and reusable styles within the application. Placing style rules within HTML should be avoided, and applying styles to specific individual elements (rather than whole classes of elements, or elements that have had a particular CSS class applied to them) should be the exception, not the rule. CSS stylesheets lack support for conditional logic, variables, and other programming language features. Thus, large stylesheets often include a lot of repetition, as the same color, font, or other setting is applied to many different variations of HTML elements and CSS classes. CSS preprocessors can help your stylesheets follow the DRY principle by adding support for variables and logic. Selecting an HTML element and retrieving and/or updating its value. Querying a Web API for data. Sending a command to a Web API (and responding to a callback with its result). For example, imagine that if a textbox's value exceeds 10, an element on the page should be made visible. In jQuery, this would typically be implemented by writing an event handler with code that would inspect the textbox's value and set the visibility of the target element based on that value. This is an imperative, code-based approach. Another framework might instead use databinding to bind the visibility of the element to the value of the textbox declaratively. This would not require writing any code, but instead only requires decorating the elements involved with data binding attributes. As client side behaviors grow more complex, data binding approaches frequently result in simpler solutions with less code and conditional complexity. Most of the features jQuery lacks intrinsically can be added with the addition of other libraries. However, a SPA framework like Angular provides these features in a more integrated fashion, since it's been designed with all of them in mind from the start. Also, jQuery is a very imperative library, meaning that you need to call jQuery functions in order to do anything with jQuery. Much of the work and functionality that SPA frameworks provide can be done declaratively, requiring no actual code to be written. Data binding is a great example of this. In jQuery, it usually only takes one line of code to get the value of a DOM element, or to set an element's value. However, you have to write this code any time you need to change the value of the element, and sometimes this will occur in multiple functions on a page. Another common example is element visibility. In jQuery, there might be many different places where you would write code to control whether certain elements were visible. In each of these cases, when using data binding, no code would need to be written. You would simply bind the value or visibility of the element(s) in question to a viewmodel on the page, and changes to that viewmodel would automatically be reflected in the bound elements. Components are defined using the @Component decorator function, which takes in metadata about the component. The selector property identifies the id of the element on the page where this component will be displayed. The template property is a simple HTML template that includes a placeholder that corresponds to the component's name property, defined on the last line. Angular also makes great use of command line interface (CLI) tooling. Getting started with Angular development locally (assuming you already have git and npm installed) consists of simply cloning a repo from GitHub and running npm install and npm start. Beyond this, Angular ships its own CLI tool which can create projects, add files, and assist with testing, bundling, and deployment tasks. This CLI tooling friendliness makes Angular especially compatible with ASP.NET Core, which also features great CLI support. Microsoft has developed a reference application, eShopOnContainers, which includes an Angular SPA implementation. This app includes Angular modules to manage the online store's shopping basket, load and display items from its catalog, and handling order creation. You can view and download the sample application from GitHub. Unlike Angular, which offers a full Model-View-Controller pattern implementation, React is only concerned with views. It's not a framework, just a library, so to build a SPA you'll need to leverage additional libraries. One of React's most important features is its use of a virtual DOM. The virtual DOM provides React with several advantages, including performance (the virtual DOM can optimize which parts of the actual DOM need to be updated) and testability (no need to have a browser to test React and its interactions with its virtual DOM). Because React isn't a full framework, you'll typically want other libraries to handle things like routing, web API calls, and dependency management. The nice thing is, you can pick the best library for each of these, but the disadvantage is that you need to make all of these decisions and verify all of your chosen libraries work well together when you're done. If you want a good starting point, you can use a starter kit like React Slingshot, which prepackages a set of compatible libraries together with React. Is your team familiar with the framework and its dependencies (including TypeScript in some cases)? How opinionated is the framework, and do you agree with its default way of doing things? Does it (or a companion library) include all of the features your app requires? How active is its community? Are new projects building built with it? How active is its core team? Are issues being resolved and new versions shipped regularly?